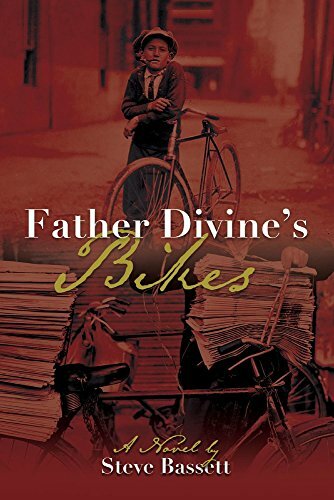 “Father Divine’s Bikes” by Steve Bassett is not only a great read – it is a cultural experience in the era following World War II. The city of Newark flourished during the war, only to fall to destitution and lack as peace spread throughout the world. With post-war employment scarce, people are losing jobs to folks they never imagined were a threat, and neighborhoods are in decline. As gangsters tighten their control of the city, a turf war creates an environment of fear in its citizens, instilling little hopes of escaping to a better life. When two altar boys take up paper routes to help support their families, they get caught up in the middle of the mob’s activities, running numbers for a group of bookies posing as barbers and faithful followers of Father Divine’s controversial cult movement. This was such a phenomenal read, definitely one of those books that stayed with me for several days after I finished reading. I was instantly transported to 1945 Newark, making my way among the citizens trying to navigate life in a rapidly changing city. The vivid descriptions of the settings and situations, the people, and the cultural contrasts of everyday life in the various citywide districts are stunning and realistic. The author’s use of genuine dialogue further adds to the overall atmosphere of authenticity. The language might be off-putting to those of a particularly sensitive nature, but there was no such thing as being politically correct in 1945, and Bassett was spot on in his delivery. I had the notion before I started reading that this book centered largely on the two newsboys, and I was pleasantly surprised that the story didn’t unfold strictly from their viewpoints. On the contrary, there is an engaging and distinct cast of characters, most of them swinging between protagonistic and antagonistic tendencies as the story evolves. The manner in which the back-story for each character was introduced compelled me to care and invest in their outcomes. The writing is exceptional and Bassett has a charming way of influencing readers with his prose. “Father Divine’s Bikes” by Steve Bassett is a must-read for those who love historical fiction, crime and coming of age. I was excited to learn this is book one in a series – the ending left me wanting more!